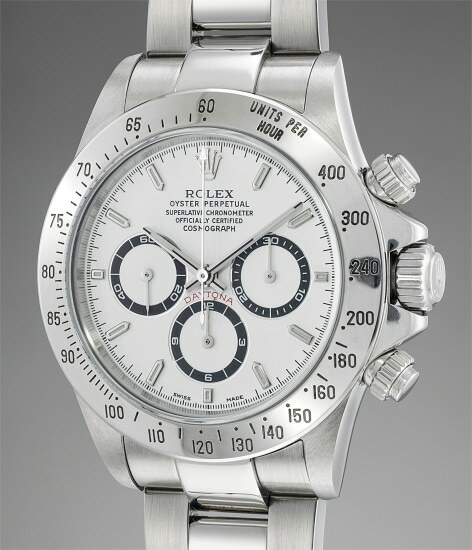 Model Name: Cosmograph Daytona "A Series"
Reference 16520 is among Rolex's most innovative models to date. Housing a heavily modified Zenith-based caliber 4030 mechanism, the model was fitted with the first automatic chronograph movement in the firm's history. At the time of launch in 1988, the watch immediately became a cult classic and garnered an immediate waiting list at Rolex retailers. The present example is known as the "A Series". Produced one year before the reference ceased production, it is today one of the most sought-after variants of reference 16520, marking the end of an era for that model. This particular watch is preserved in most probably unpolished and unspoiled condition, featuring sharp factory finishes to the top of the lugs. The watch is even accompanied by its original punched guarantee, having been retailed in Frischknecht Juwelier in St. Gallen, Switzerland.